The day I made banana chocolate chip muffins, I came to realize that our freezer must clone the ripe bananas we stick inside its frigid interior. I know. . . . it sounds outrageous, doesn’t it? But how else could we have accumulated so many? The recipe I had called for two ripe bananas. Well, just imagine my surprise when I found six frozen bananas instead. I certainly didn’t remember putting that many in there! Where had they come from? My plan had been to use up the bananas I had. I had all of the ingredients prepped for one batch of Banana Chocolate Chip Muffins using 2 ripe bananas. I needed to use up the frozen fruit but I didn’t have enough of the sweet goodie ingredients for three batches of muffins. Somehow I was going to make this work! Normally, I don’t like to change the formula of a quick bread or cake recipe, too much goes into the correct combination of ingredients. I was a little worried about adding too many wet ingredients with the dry, but nothing ventured; nothing gained. I took the plunge and decided to use all of the bananas and then adjust for the increase in volume. First thing I did was to peel the frozen bananas and put them in a wire strainer that was over a bowl. 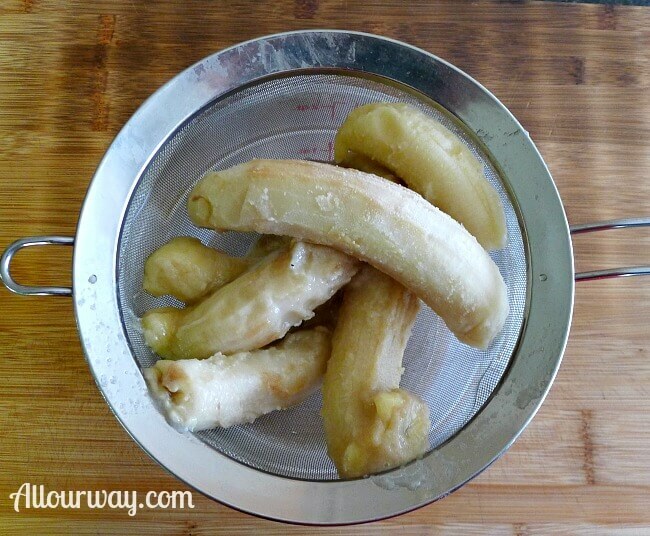 Ripe bananas, once they are frozen, release a lot of liquid. . . .
. . . .I wanted to save that liquid then reduce it by simmering it in a pan. I remember using this technique a long time ago when I made banana bread. I tried to find that recipe — no luck! The bananas drained over the bowl for about 3 hours and released a total of 2/3 cup liquid. I poured the liquid into a small pan over medium-low heat and let it reduce to one half of its volume — 1/3 cup. Once the ingredients were mixed, according to the direction, I used a scoop to measure the stiff batter into the muffin cups. This was the first time I used these brown parchment paper cups and I really like them. They hold more than the regular baking cups and the batter isn’t likely to run over as they are baking. I sprinkled coarse white sparkling sugar on the muffins then popped them into a 350° F oven for about 30 minutes. The muffins rose beautifully in the oven. I realized that the modifications hadn’t hurt the appearance of the muffins. I still had to test whether the texture and the taste would be up to par. Waiting for the muffins to cool so that we could do the final quality test wasn’t easy — the rich aroma of banana, chocolate, and cinnamon was testing our patience. 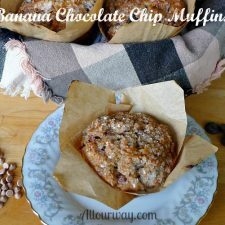 We finally cut into the muffin and we were very pleased with the appearance but it was nothing compared to the pleasure we got from the taste of the Banana Chocolate Chip Muffin — it was a banana split in muffin form. Reduced liquid from the bananas about 1/3 cup. Heat the oven to 350 F. Lightly grease 12 standard muffin cups. 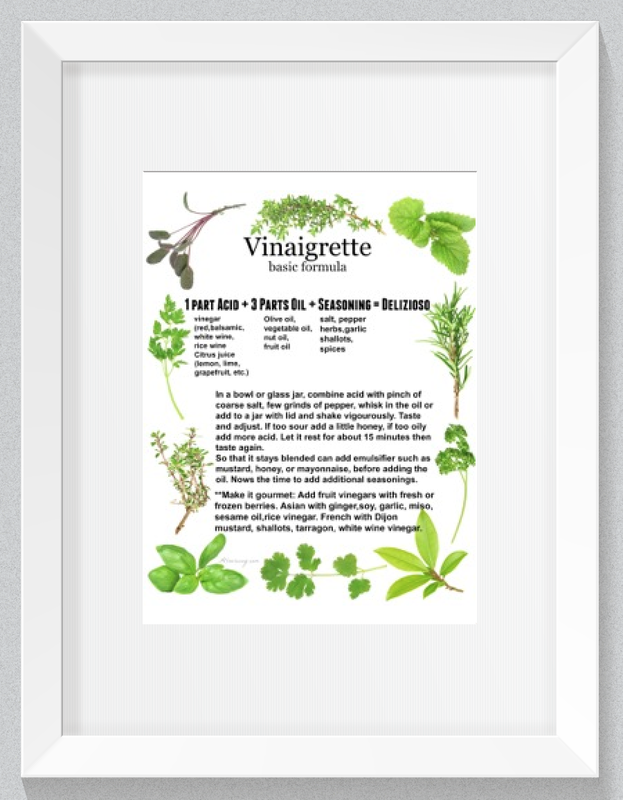 I used parchment paper liners which are larger in size and sprayed them lightly with oil. You may need additional muffin cups if you use all the add-ins. In a small pan bring the banana liquid to a simmer and continue to cook until the liquid is reduced in half -- to about 1/3 cup. Let cool. In a medium-sized mixing bowl, beat together the butter and sugar till smooth. Beat in the mashed banana, then the egg, the flavorings, and the cooled reduced banana liquid. In a separate bowl whisk the baking powder, baking soda, salt, and flours until it is thoroughly mixed. Add it to the wet ingredients and stir till smooth. If the mixture has a lot of lumps, beat at a higher speed until they've nearly disappeared. Stir in the bittersweet chocolate chips, walnuts, and cinnamon chips. 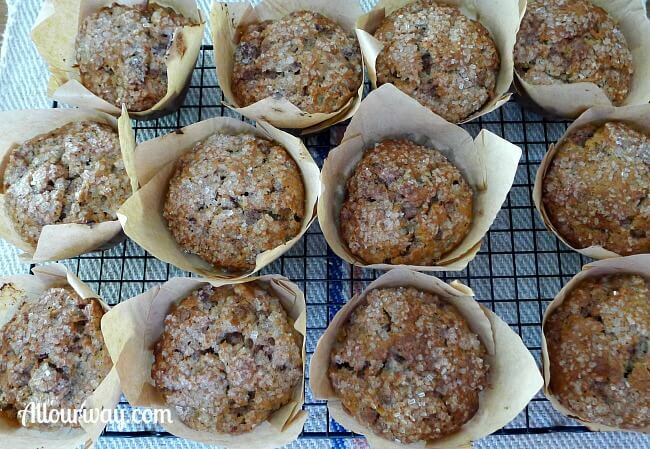 Heap the thick batter into the prepared muffin cups, mounding them quite full. I used a large scoop to fill the muffin cups. Sprinkle the tops of the muffins with coarse white sparkling sugar. Bake the muffins for 25-30 minutes, until a cake tester inserted into the center of one of the middle muffins in the pan comes out clean. Remove the muffins from the oven, and tilt them in the pan to cool a bit; this will prevent their bottoms from becoming soggy. As soon as you can safely handle them, transfer the muffins to a rack to cool completely. This sounds like the perfect muffin to have with my morning coffee. 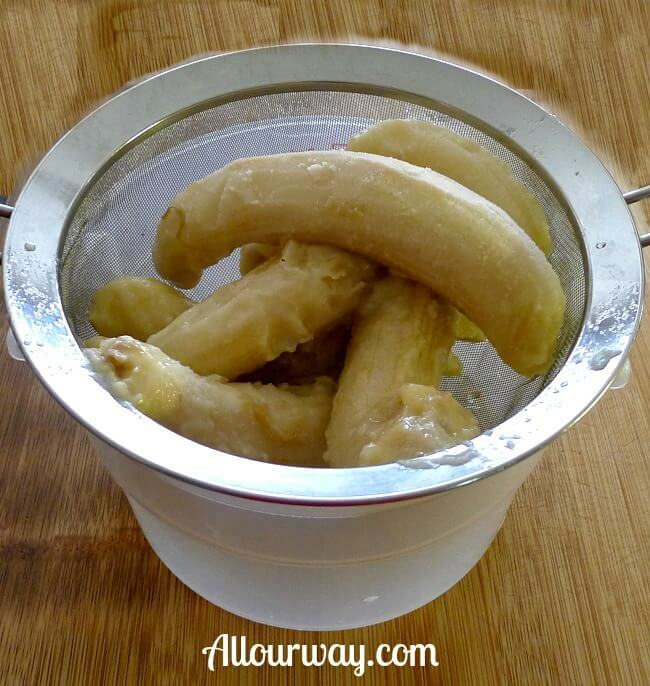 Always a great way to use ripe bananas, and I have them ALL the time. In fact, my freezer is full of them too. I will have to make a batch of these for the grandkids. I think they would love these to take to school. I just checked in my freezer too and I have so many bananas in there!! See, they must clone in your freezer too, Cathleen. How did you know I had some ripe bananas on my counter in need of a tasty use? I’ll definitely be making these this week! These sounds so amazing, and I’m sure my family would seriously enjoy them! can I use this batter to make banana bread in a loaf pan too? It looks so good I want to slide and butter it. thanks for this recipe. I looove it when bananas and chocolate chips are combined. Your muffins look so yummy! I’d love to eat one to start my day, and then another mid morning, and perhaps a third with my afternoon cup of coffee! Oh my goodness – that’s totally hilarious about how your bananas multiply in your freezer! We must have the same one as you! 😉 And I’m absolutely in love with the idea of reducing the banana liquid to concentrate the flavor – that’s just crazy-ingenious! What a terrific idea (and … ahem … just the solution I’ve been needing to deal with my own banana stockpile)! Hi, Shelley!! You can concentrate the flavor for breads, muffins, etc. anything you make. I couldn’t believe the difference it made. It may take a little bit more time but OMG it tastes so much better. 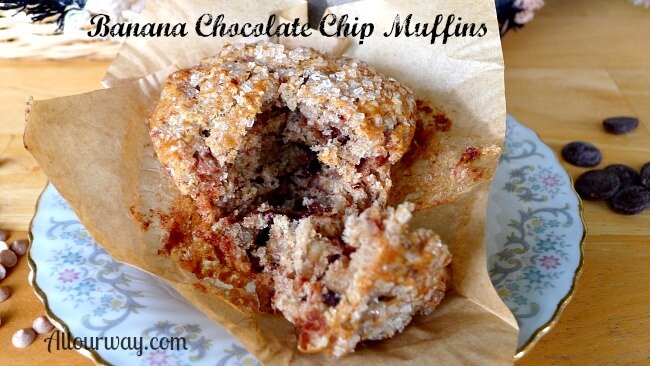 Umm….cinnamon chips in banana muffins – GENIUS! That sounds so amazing. I’ve never thought to drain my bananas before but that makes a lot of sense. I’ll have to give it a try! A freezer that clones bananas? I’M INTRIGUED. Seriously tho, this is a perfect recipe for using them up. I’ve never been a huge fan of banana breads, but these muffins have so much other deliciousness going on—butter rum, HELLO! And chocolate?! YUM.—that I’m sure I’ll love them. My stepfather was always saying “waste not, want not” when I was growing up…it’s so smart to save overripe bananas in the freezer. But i think all fruits get watery with thawing! Reducing them is a great solution. Oh my word! They look so delicious! I always freeze my bananas too, but have used the liquid as another wet ingredient! Cool idea! I have to try that! I’ve never used the banana draining technique that you used, but I think it’s brilliant! Can’t wait to try it. You’ll love it, Jenni! It really concentrates the flavor. 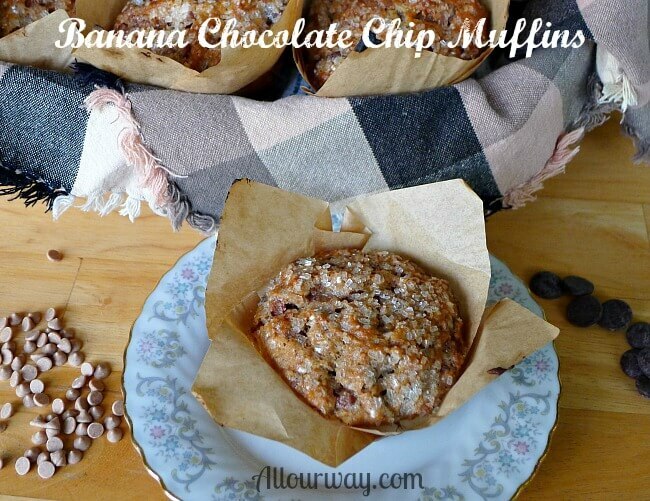 You really can’t go wrong with the whole banana chocolate chip combo can you? 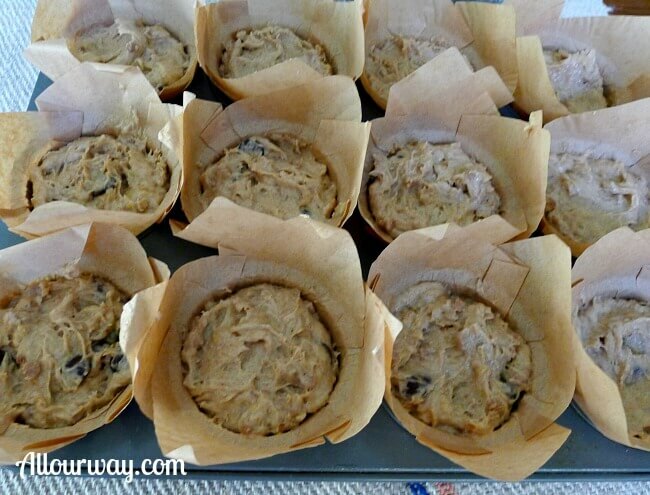 I love banana bread and I’m really looking forward to trying these muffins! Hi, Kat! Yep! We do love our banana and chocolate chip combo. If you can get the cinnamon chips add those too. Really adds lots of flavor. I have some bananas in my freezer right now. I usually use them for smoothies, but I want to try these muffins. Hi Leslie! The method I use works beautifully!! You get a great banana taste when you concentrate the banana juice. Let me know how you like the recipe. 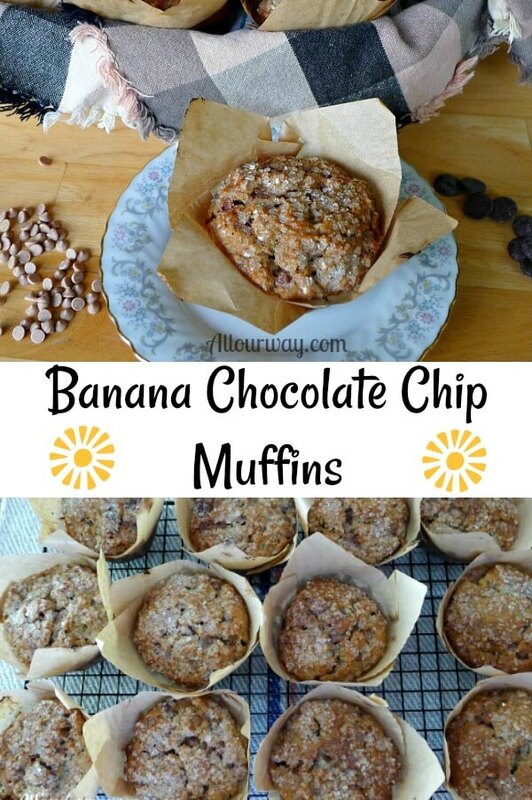 These look tasty and a great way to use up extra bananas – have never tried with previously frozen bananas but does mean you can have them any time which can be handy. Hi, Caroline! The frozen bananas work great. As they get too ripe to eat, throw them in the freezer and when you get enough,make the muffins. You can use that banana liquid process with any banana bread or muffin recipe. You really get an intense taste. Wow these muffins look amazing! Going to make these this weekend! You will enjoy them — rich in banana taste! !